The foundation “Mond- en Kaakchirurgie Tanzania” exists since 2001 and much has been accomplished since then. The foundation was founded when it became apperant that promovendus Elison Simon at the Radboud University in Nijmegen, from Tanzania, had only minimal materials and instruments tavailable in Dar es Salaam to treat his patients. The original goal, to support the department in Dar es Salaam with sufficient means to improve the education and training of new colleagues, has long since been accomplished. The education and training of Dr Jeremiah Moshy has been fully paid for by the foundation. His training took place in Nairobi, Kenya, where at that time the only training program existed for the whole of East Africa. He attended a four year program, which made him a well trained surgeon fully equipped to meet the demands of the African population. Dr Moshy is now leading the department that is currently involved in training of residents in Oral and Maxillofacial surgery in Tanzania. The latter is the result of intensive negotiations between the Kenyan and Tanzanian colleagues in the context of the Eastern African Association of Oral and Maxillofacial Surgeons. They have agreed on a mutually recognized training program, which will serve the whole Eastern African region. The International Association of Oral and Maxillofacial Surgeons has been instrumental to accomplish this agreement. At present, they accept two trainees per year, including residents from neighboring countries. The foundation has collected and invested in several materials and instruments to support the education and training program in Dar es Salaam. Expansion of the operating fascillities, financed bij the IAOMS Foundation, with help from a generuous gift by the Nina Harris Pebley foundation has certainly been a great help. Over the years several shipments have been sent to Dar es Salaam which included a complete anaesthesia apparatus, which was a donation from the Radboud University Nijmegen Medical Center, several dental chairs which became available from an Oral Surgery department of Eindhoven, The Netherlands, whilst numerous badges of surgical instruments have been donated as to facilitate the extended scope of practice, including the growing number of people working at the department. To facilitate teaching i.e. education and training of residents, books computers and other instructional material has been sent. The Foundation, continues to follow up on its aims to support the department in Dar es Salaam and to promote self sufficiency. Spectacular progress has been made for patients with big ameloblastomen (agressive maxillofacial tumors). They used to be treated by resection without reconstruction due to limited knowledge and tools. A project, in which the jaw of thes patients is reconstructed, has lead to dramatic progress and enormous improvements in quality of life. Dr Simon has described this in his Thesis and since then many patients, treated with this technique, have been able to live a normal life after surgery. This was made possible by a generous gift by KLS-Martin who provided the nessesary fixation plates and screws. Dr. Simon receives the instruments donated by KLS-Martin in 2012. The Muhimbili National Hospital in Dar es Salaam is now sufficiently furbished and new Oral and Maxillofacial surgeons are being trained. Using the department in Dar es Salaam as educational site, the foundation aims to expand the availability of treatment for patients by starting satellite Oral and Maxillofacial departments in the three regional hospitals (Bugando Medical Centre in Mwanza, Kilimanjaro Christian Medical Centre in Moshi and Mbeya Referal Hospital in Mbeya). The colleagues in Dar es Salaam should have the key-role in the neccesary negotiations with the authorities. In 2014, negotiations with the Kilimanjaro Christian Medical Center, in Moshi, have resulted in an agreement to establish a satellite department in that hospital that will be launched in 2017. The neccesary instruments and other materials such as an X-raymachine and Dental chairs have been donated and have arrived in Moshi in November 2016. 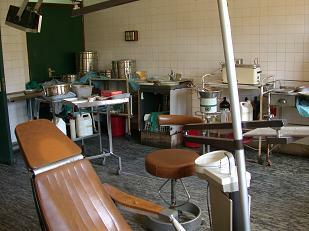 The treatment rooms are currently being renovated and prepared for use. 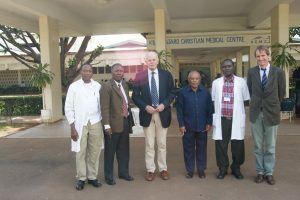 Paul Stoelinga and Thijs Merkx with representatives of the medical staff and management of KCMC in Moshi.